Hi! Welcome to the sixth installment of Tutorial Tuesday! I thought that I wouldn't make it this week, but so far so good. 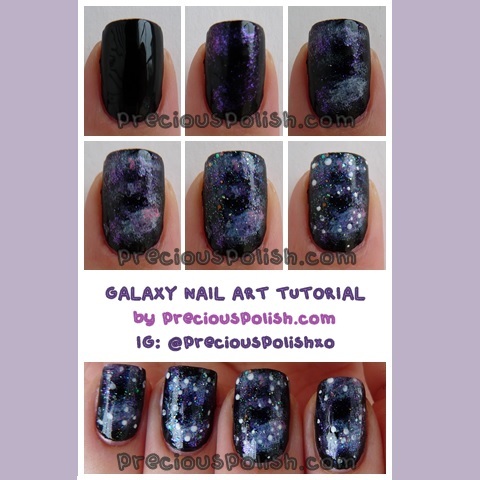 I've had a few requests for a tutorial on galaxy nails before, so it's finally here. I actually really like galaxy nails and I don't know why I don't do them more often. They're super easy to create and almost foolproof! I had originally planned on doing a pink/purple-based galaxy, but it ended up being more blue-based. The trick to altering the colour of your galaxy is the based on the colours you add on top of the white polish in the tutorial. Next time I'll actually go through with the pink/purple galaxy, because the ones I've seen look so pretty! Alright, enough small talk, here's the tutorial! Start with a base coat and a black base. Let that dry. Dab an iridescent or sheer shimmery polish on a makeup sponge. Sponge it onto your nail in the shape of your galaxy. Repeat the previous step with a white polish, but dab your sponge on a paper towel first to remove excess polish. Dab small amounts inside of the shape you made before. Repeat with other brighter colours, applying less polish than before. I suggest light pinks, mints, purples and blues. Dab on a glitter top coat with the polish brush wherever you would like. I suggest sparse glitters in a clear base that includes various glitter sizes. Add stars using a white polish and a dotting tool. I prefer smaller stars in clusters on top of the galaxy shape. Seal it with a top coat and you're done! Hi everyone! I moved back home yesterday which was quite the fiasco, and as a result I'm feeling incredibly drained nail art-wise. I managed to muster up some energy for the first prompt for gluttony in the deadly sins challenge: "Delight yourself with a sugar spun inspired manicure." To be honest, I never really liked sugar spun manicures. I hate the idea of thick nail polish, and these are no exception. I'm not entirely pleased with these, but they'll have to do! I tried to keep things subtle by using light colours and doing the spun sugar look over a glitter. This glitter is new to my collection and it's unlike any other that I have. The milky base makes it like a glitter/jelly sandwich in a bottle! I tried to do my spun sugar as fine as possible to avoid thick clumps. I placed drops of polish on aluminum foil, allowed it to dry a bit to become tacky, and then draped the tacky polish across my nail with a dotting tool. You can find lots of tutorials for this look on YouTube! I started with a base of American Apparel L'Esprit, followed by Hard Candy Sweet Tooth. On my middle and index finger I used American Apparel L'Esprit and American Apparel T-Shirt to do the sugar spun look with a dotting tool. I finished it off with pink and blue rhinestones on each finger by the cuticle. Be sure to visit the other talented bloggers to see their spun sugar manicures! Here are my nails for day two of the deadly sins challenge. Today's prompt is: " Let your body talk and feel free to do whatever you want" while keeping with the lust theme. I decided paint some realistic roses on my nails. My thought process behind this was that roses are romantic and seductive, but also that every rose has its thorn... or something. I'm not sure, just go with it haha. I've really been into these more realistic nature patterns. I'm experimenting a lot with shading and highlights, and less outlines. I really enjoy doing these because they feel very natural and actually less methodical. They're a lot easier than geometric prints and these only took about half an hour from start to finish. I started with a base of OPI Don't Pretzel My Buttons. I used a striping brush and Sephora by OPI And Then He Said... to paint the basic shape of the roses. I then shaded with American Apparel Port, followed by American Apparel Hassid and a bit of OPI Don't Pretzel My Buttons to highlight. For the stems and leaves I used American Apparel Hunter followed by American Apparel Army Jacket for highlights. Don't forget to visit the other participants in the challenge for more lust-themed nail art! On a lighter note, I'm really excited to post these nails for you. I saw this pattern on a mug while shopping awhile back, and I finally mustered up the courage to try it out. The painterly style was pretty overwhelming and I was quite sure that this wasn't going to work out, but I went ahead and tried it anyway. In the end I'm really glad that I did them and I'm super happy with the results. This style was actually a lot easier to paint than I expected, and didn't take a particularly long time either. The way I did it was by working from lightest to darkest, adding more shades as necessary. The trick was to use minimal amount of polish on my striping brush, using residual polish to create semi-opaque, feathery brush strokes. I started with a base of OPI Green-wich Village. Then I went in with a striping brush and American Apparel T-Shirt to paint all of the outlines and shapes. I shaded with American Apparel Echo Park, followed by American Apparel Hassid. The first week is Lust and the prompt says, "Be a bad girl and make something you have wanted to do soo badly." I have a long list of things that I've been wanting to try out, and chevrons have been on it for ages. I think I've tackled them once or twice before and they were both disasters that never made it on the blog haha. I've seen many perfect tape manicures that achieve the chevron look but since I don't have scrapbooking scissors, I sucked it up and freehanded these. I started with American Apparel Office on all of my nails except for my ring and thumb, where I used Essie Beyond Cozy. I painted the chevrons and heart with a striping brush and American Apparel T-Shirt and then filled them in. Then I outlined them with Essie Beyond Cozy. Be sure to visit the other ladies below for more beautiful manicures! Hello! Today's tutorial revisits an old design of mine that became quite popular. I had a lot of questions asking for a tutorial for this print, and here it finally is! This swallow design is a really easy one to paint, and only requires a few quick steps. I started my nails off with a white-blue gradient to resemble the sky. The gradient isn't part of the tutorial, but it's completely optional. I've seen really cute swallow print manicures with solid backgrounds, one of which uses black swallows on a light pink background. Very chic! The polishes I used for the gradient are American Apparel T-Shirt, American Apparel American Denim, and American Apparel Cameo Blue. I blended these together on my nail using a makeup sponge. Paint your nails with your base coat and then a solid colour. Let that dry. I prefer the design with a gradient base, but you can skip this step and just keep your solid colour. Use a polish of your choice and a striping brush to start creating the bodies of the birds. 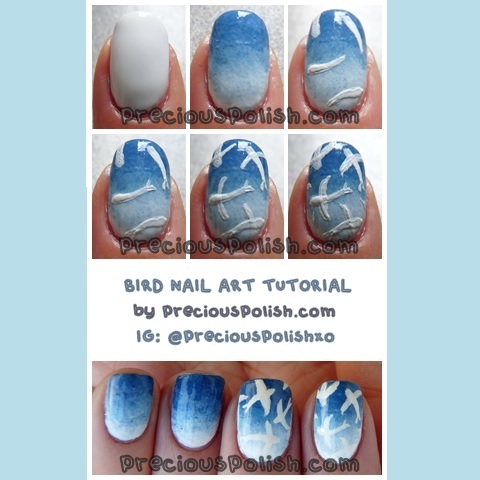 Paint several curved lines on your nail, and thicken one end of the line to a slight point for the heads and beaks. Paint a small 'v' shape at the thinner tip of each line for the tail feathers. Paint a slight 'C' shape through the body for the wings, closer to the thicker end of the body. Thicken up the wings closer to the body, ending the wings at a more pointed tip. Seal it all with a topcoat and you're done! I hope this tutorial was helpful to you and thanks for looking! Hi everyone, I hope you're having a nice Saturday. If there's one thing worse than doing your nails without a plan, it's doing your nails with a plan that fails. I picked out two colours and just went with it for this design. Usually things work out okay, but sometimes, like today, there are those rare instances where nothing works. After a lot of trial and error I finally ended up with these: a chevron-like pattern with a small, curved gradient at the cuticle. I usually plan out how I'll apply the polish beforehand, but not this time, so this isn't my neatest work. After a lot of experimenting with the gradients and colour placement, the layers upon layers of polish ended up quite thick :( Despite all of this, I kind of like the design. It reminds me of the blue and orange flames on a Bunsen burner haha. I started with a base of American Apparel Summer Peach on all of my nails, but ideally I should have used American Apparel L'Esprit on my thumb and ring finger. Then I outlined the curved chevron pattern with a striping brush and American Apparel Imperial Purple. I applied the gradient near the cuticle with a makeup sponge, and also applied the same colour along the tip of my nail. Then I fixed up the pattern one final time. Thanks for looking and have a good weekend! Hi all! Hope life is treating you nicely! The weather here has been bipolar, and I just woke up to a window full of snow. I'm not too impressed with April thus far, but hopefully things turn around next week. Anyway, this is a manicure that I did while at home, so I didn't have my usual polishes and tools. It's kind of exciting to go home for that reason though- I get to revisit all of the neglected polishes that weren't deemed worthy enough to travel with me to university. In this case I got to try two newer spring polishes and a pretty blue glitter. I started with OPI You're Such A Budapest on all of my nails. Then I used a striping brush to paint on and fill in the halfmoons with China Glaze Fade Into Hue. I used a dotting tool to pick up and place individual pieces of hex glitter from Sephora by OPI Indi-Go With The Flow along the halfmoon. Then I used the polish brush to concentrate more glitter around that area, dragging the brush toward the tip to create a gradient. Hello and welcome to the third Tutorial Tuesday! I'm really excited about today's design because I love how the whole manicure turned out. I'm actually still wearing this design on my nails as I type this, which is pretty unusual. So enough introductory chatter- let's jump right in! I already posted these nails on Instagram on Sunday, but saved this blog post for Tutorial Tuesday. This fishtail design is one that I came up with last spring. I've actually done a photo tutorial before for it, but I decided to redo it for Instagram. I changed it up by using four colours instead of three, and I also think that these new instructions are easier to understand. Select four polishes. Start with your base coat and your base colour. Let that dry. 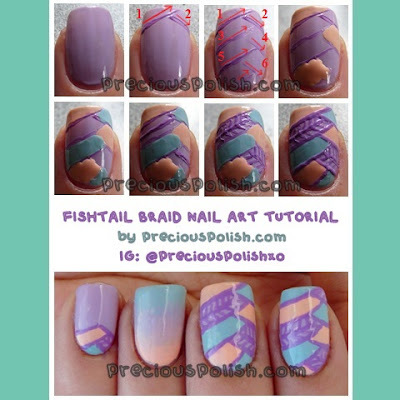 'Sketch' out your fishtail design using your darkest colour and a striping brush. These lines do not have to be neat. Paint lines starting from the tip of the nail, following the direction and order of the lines in the photo. Continue doing this, working your way to the cuticle. Fill in the section at the tip of your nail using the brush from the polish. From there, fill in the very next section that doesn't touch the first section, i.e. skip two sections. It's okay to paint over your sketch lines, but be careful not to paint into other sections. Repeat filling in sections with your next colour. In the sections that still have the base colour showing through create thin diagonal lines down the middle, parallel to the direction of the section. Create small diagonal lines on each side of the line from Step 6 for a leaf-like pattern. Go over all of your sketch lines again to neaten everything up. Finish with top coat to smooth out all of the polish, clean up, and you're done! Hi all! Sorry for another late update tonight. I've been having the hardest time writing blog posts lately. It's like all I want to do is paint my nails and post photos, minus all of the usual rambling. I've been putting much more effort into blogging and nails since this year started though, so I guess it's taking a lot out of me. I'm having trouble finding things to say while keeping 'fresh'. Any advice to beating a blogging rut? I went for another gradient for these nails, using some trusty cotton candy colours. After doing tribal print and triangular cutouts on "Hidden Holo" I decided to try out the look again, this time going for an hourglass shape. I'm not sure if I like how the cutouts look but I'm very pleased with the gradient tribal, especially the one on my middle finger. I'll definitely be trying it again! On my index and middle fingers I started with American Apparel T-Shirt. I used American Apparel Coney Island on my ring finger and American Apparel American Denim on the rest. For the cutout nails I used a sponge to paint gradients with Essie Nice Is Nice two blend the blue and pink. I then painted a white 'X' across my nail, filling in the sections closest to the cuticle and tip. For all of the nails I proceeded to paint the tribal designs using a striping brush and a dotting tool. I started at the cuticle of each nail, painting with whichever colour matched the gradient. Then I worked at the tip, finally using the purple at the middle to blend the colours together.